The laundry room is a space with great potential for you to develop your creativity. It is true that this is usually a small space that is meant for function rather than enjoyment, but that doesn’t mean it can’t look good and aesthetically pleasing while remaining simple and functional. It’s in fact quite the opposite. A functional, well organized and decorated laundry room is not only much more pleasing to be in, but it’s also likely much easier to use, as things are accessible and stored more efficiently. That is not to say that you need to spend thousands of dollars in a full laundry room makeover. A few, small changes can make all the difference. You can see for yourself in this before and after laundry room makeover gallery. This makeover really shows you how to make great use of a small space. The dark, open wall cabinet is very compact and functional, and it really sets the tone for this bold decoration. The addition of the wooden counter adds functionality and the rug matching the cabinets is a great finishing touch. See the full makeover tutorials on homedepot. This is, once again, one of those cases where you could see a real effort had been made to decorate the room before, but it still needed an update. The pictures were replaced by a modern, solid wall color, and extra open shelves were added for storage, in order to clear the clutter. The use of baskets not only looks cool but also prevents clutter from accumulating again. See the full makeover tutorials on jennaburger. This laundry room makeover is so drastic that it is hard to point out every single element. The new organization with the matching white machines and cabinets is great and makes perfect use of the space, but the stenciled pattern on the walls has to be the star of the show because it not only looks beautiful and elegant, but also makes the appliances pop even more. See the full makeover tutorials on viewalongtheway. This laundry room makeover fits shabby chic luxury on all accounts. While the practical elements like the cabinetry and shelving are quite minimalistic, it is the details like the chandelier and the paintings that bring the room’s decoration to life. See the full makeover tutorials on rightupmy-alley. Almost every single laundry room makeover is focused on getting more storage, and it’s easy to see why. That was accomplished here by embedding the machines in a cream storage unit and then hanging a matching one to make better use of the formerly empty wall space. See the full makeover tutorials on wallsunderconstruction. 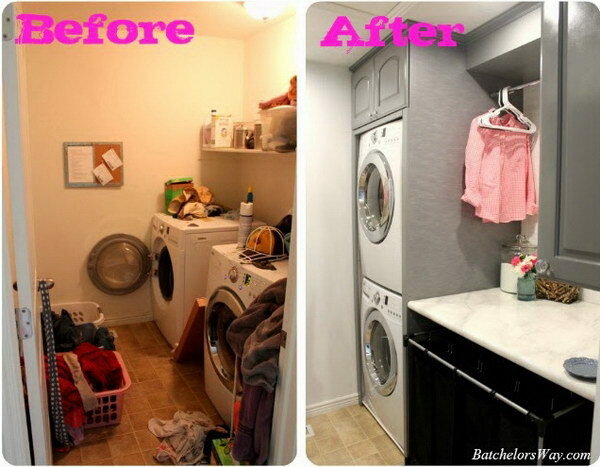 This laundry room makeover is so complete that even the washer and dryer themselves were replaced. The addition of the counter and cabinets is great from a functional as well as decorative point of view, and the contrast of the newly painted charcoal wall and white cabinetry adds elegance and a 3D perspective of the small space. See the full makeover tutorials on hookedonhouses. Nothing fits a laundry room makeover better than a fresh coat of pristine white paint and a wall cabinet, as those make the most difference in appearance and space usage. A wall color change and some functional-decorative details on top of the machines add the finishing touches in this case. See the full makeover tutorials on newtoncustominteriors. This laundry room had all the space, but none of the organization. The floors were replaced, and the messy clotheslines gave way to pristine white furniture. Woven baskets add the finishing, rustic touch to the decoration. See the full makeover tutorials on worthingcourtblog. This is your modern laundry room makeover, but with a twist. The original floor was replaced by this vintage looking black and white tile, and while the furniture and appliances are white, like we’ve seen in most cases, the wooden shelves give it a different, rustic touch. See the full makeover tutorials on diybeautify. This laundry room makeover is truly charming, and it shows a lot of attention to detail. The floor and wooden accented cabinetry are similar to the previous example, but chandelier, wall and door decorations are quite unique to this room itself. See the full makeover tutorials on lindahomeiswheremyheartis. The white shelves and hanging clothesline were definitely needed in this laundry room, which previously had no storage units at all. The woven baskets add a charming touch and provide further organization to the space. See the full makeover tutorials on duoventures. This laundry room was basically done from scratch. The clothesline was removed, the walls painted a solid white and the floors replaced. A washer and dryer were added with a marble counter on top, and matching wall cabinets provide the necessary storage. See the full makeover tutorials on paperdaisydesign. This is another case of a room that was completely done. A tile backsplash was added behind the new wall cabinet and the machines, and a new, contrasting tile floor replaced the original one, for a cleaner, more graphic look. See the full makeover tutorials on vintagerevivals. This budget makeover is all about the details. The addition of a wall cabinet and shelves brings it up to date and provides modern storage for necessities while the decorative elements add cozy warmth to this room. See the full makeover tutorials on cravingsomecreativity. Wrap-around shelving is a great solution for laundry room storage. This natural colored one works nicely with the graphic decorative pieces and the cream wall color. The baskets add a traditional touch to the makeover. See the full makeover tutorials on abeautifulmess. This laundry room was originally quite outdated and in need of a makeover. The closet-style storage featuring both shelves and hanging space is minimalistic but works quite nicely here. See the full makeover tutorials on maillardvillemanor. This laundry room used to be an outdated mess. The addition of a console made it look much more organized and the wall cabinets with hangers are quite handy when taking loads in and out. See the full makeover tutorials on aroundthewattshouse. This laundry room was originally a complete mess. Everything was completely renovated, from the floor to the windows and the cabinets, in order to clear and organize the space. The addition of a table and chair makes great use of the space and gives users a place to hang out while the wait for loads to be done. thriftdiving. This was definitely a bold makeover. The lighter, brighter wall color gives the impression of a bigger space while the pops of yellow add a fun twist to this otherwise strictly functional room. The wall-mounted shelves provide easily accessible storage and match the rest of the furniture flawlessly. See the full makeover tutorials on lilluna. This laundry room was drab at best before the makeover. Now it looks much bigger and brighter with a new wall color and the whitewashed wooden floor. The distressed sliding door adds a fun and unexpected twist to the makeover. See the full makeover tutorials on natalme. This little laundry corner was fairly minimalistic and out of style. The black and white makeover created on top of a stripped floor and a tile backsplash adds a contrast that makes it edgy and modern. See the full makeover tutorials on emersongreydesigns. This room had a lot of empty wall space so the sky blue cabinets, which look beautiful against the pale wall color, were added for storage purposes. The Laundry sign above the big, open shelf is a beautiful, decorative touch that also fills up the space. See the full makeover tutorials on cherneeshouse. This grayscale laundry room is quite unique, as the washer and dryer are stacked in the corner to make better use of the space and allow for a full storage unit, which looks much cleaner and more organized than open shelving. It’s a great idea to adopt for smaller spaces like laundry closets. Get the details via batchelorsway. This room got a nautical/rustic themed makeover which is fun with its little decorative touches like the laundry sign but doesn’t become cluttered. 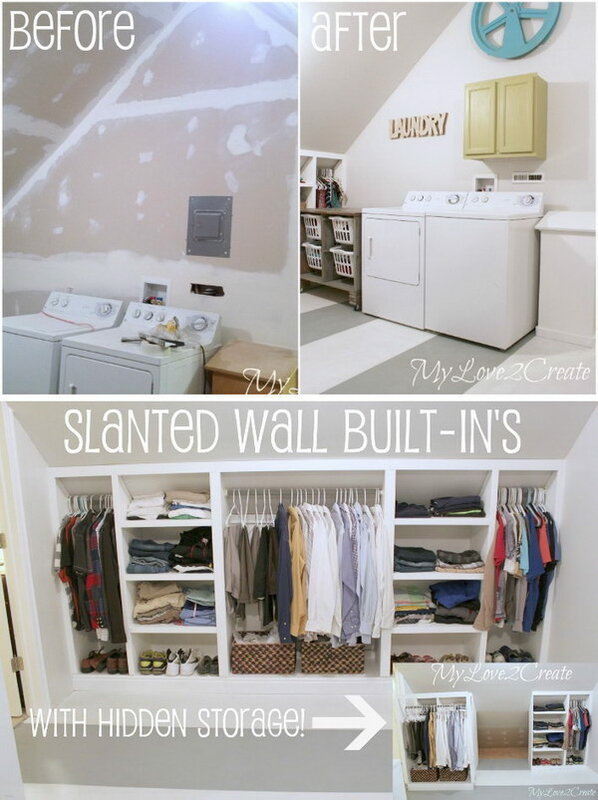 The slanted wall built-ins are a great, compact and functional storage idea that really worked here. mylove2create. This laundry room benefitted from an all-white makeover, including the addition of an open wall cabinet and slab wood flooring. The new look makes it appear much lighter and brighter than the dungeon it was before. 4men1lady. It’s so nice to look at these makeovers. 🙂 There are some really nice design ideas in this post, thanks for sharing!